Dorrit St. John was instrumental in the creation of NEWH back in 1984. There was a common feeling among many women working in the hospitality field at that time, that although some women had “made it” professionally, women in general were not fully accepted. Dorrit St. John, who was then President of Purchase Services Limited, suggested to Susan Spalding, then with S. Harris, and Shelia Lohmiller of Lohmiller Associates, that they get together and discuss what they could do to change the status quo. Born in Vienna in 1924, Dorrit’s childhood took place in the midst of the Holocaust. In the book, “48 Hours of Kristallnacht: Night of Destruction/Dawn of the Holocaust,” she shared a particular recollection of that awful evening. Dorrit worked as a retail buyer, a manufacturer of architectural special effects and was a licensed contractor before joining Purchase Service Limited (PSL) in 1975. In 1979 she was named President/Partner of PSL and oversaw offices in Los Angeles, Hong Kong, Singapore, and London. A legend in her own time, “The Madame” would sit at her desk with her lovely, long orange polished nails and cigarette holder, holding court over the hospitality industry! How we loved her …. Dorrit was awarded the first NEWH Woman of the Year award in 1990. 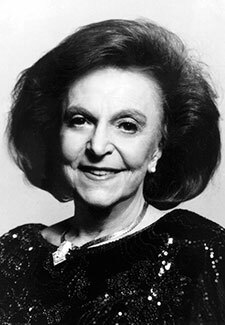 Dorrit retired in 1994, but was still active in the community volunteering at her local police department and for USC Shoah Foundation Institute. Dorrit passed away on March 9, 2016 and is interred at Mt. Sinai Cemetery in Los Angeles, California. NEWH/Los Angeles Founding Chapter is proud to have a scholarship honoring one of NEWH’s original leaders. Click here to donate to the DORRIT ST. JOHN SCHOLARSHIP FUND.